As we all know... things do not always go our way. Life has its challenges. But every cloud, does have a silver lining. Last week, I got some news. Something that I worked hard for, did not happen. It was not meant to be... at this time. And wouldn't you know, it was a cloudy, gloomy day... no sun in sight. I let it get me down, allowed some self doubt and a bit of sadness... for about 45 minutes. The good news... at 50 plus, I have experienced disappointments before and know how to bounce back. Good things, including experience, come with age! Plus, I have great people to support me and tell me to keep going, keep pushing, that what I am doing is the right thing and that it will happen and if not, they know I will find another way! That my friends, is the Silver Lining. We all have them... the positives in every situation. In this case, it's to have those that love and support you, alongside you, when you need them most! I have not found another way ... YET, but those of you that truly know me, know I will. This is a goal, I will achieve. More good news is, the sun came out that day and it did shine brightly! My "Silver Lining" (family and friends) helped me to ignite my resolve, continue on the path, and to keep pushing for what is important and what I am working toward. These pics were taken in Texas during my recent visit but this top, made in Italy, was purchased at one of my favorite shops in Ft. Mill, SC... Crossings on Main! Funny that this top is silver and also, has a "silver lining." The jeans are William Rast... fun and stylish, with a frayed cuff. These Sam Edelman black booties can be worn with any outfit and have the perfect heel. A simple look, with a bit of flair! Hope you can see my determination and resolve as well as the sun shining through. No, I was not contemplating hopping on the next train through, though the thought did cross my mind, after reading about this US cross country train trip, which sounds like a blast. This casual look is fun as I don't wear a lot of bright colors. When I found this bright pink vest, I thought you might enjoy it too! It is a bargain!! 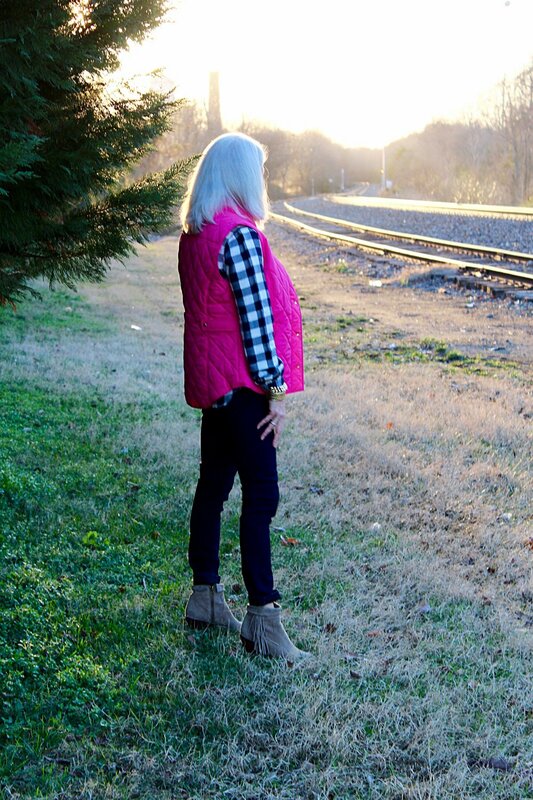 Quilted vests are such an easy wardrobe accessory in the south, when the day starts and ends on a chilly note, but the rest of the day is warm. As you may have gathered by now, I love checks and plaids and could not pass up this William Rast Navy/White Buffalo Check shirt. These jean/leggings are Calvin Klein in dark navy, and a good value too. The booties are FtC (From the Closet), and are Sam Edelman. Who agrees that fringe is fun?? This photo was taken in Pineville, NC and is a few steps down the tracks to a new brew pub. A fun place to hang out after work with a couple craft beers! PS. The last picture indicates that I need to continue my Yoga practice as I had trouble staying on the rails...and yes... this was before the brew pub!